Pariox Scheduling and Documentation features are seamlessly incorporated and integrated with Billing and Payroll. 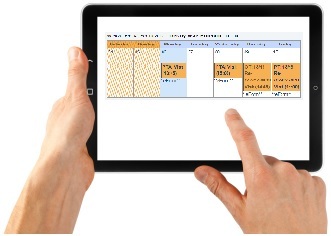 Our transparent, interdisciplinary calendars offer scheduling compliance that is unmatched! It’s impossible to schedule over the frequency. It’s impossible to schedule out of the certification and/or authorization period. It’s impossible to schedule outside of the agency-specific Medicare week. Reduce costly missed visits by catching them before they can happen, with just one click of a button. Track automated 13/19/30 reminders for each patient. No double entry needed at any stage of your operation. One screen, one schedule to see all REAL TIME visits scheduled for ALL disciplines involved. Visit documentation is conveniently accessible directly from a patient’s schedule. Easily view cert period dates, authorized # of visits, visit counts, and MORE from our intuitive schedule.